Macrophages, meaning big eater (from the Greek, makros (large) and phagein (to eat)), are cells, present in all tissues of the body, that engulf and degrade large foreign particles, such as microbes and also scavenge abnormal self structures such as cancer cells, dying cells and cell debris. Macrophages also possess trophic functions, producing factors that contribute to the normal embryonic development of various organs and tissues and to the maintenance of their structure and function in the adult. Fig. 1. Role of CSF-1R in the development and function of the nervous system. Activation of CSF-1R in neural progenitors promotes the formation of neurons while activation in microglial progenitors promotes microglia formation. In mature microglia, CSF-1R activity is necessary for survival and to stimulate proliferation. Microglia provide factors that sustain neuronal survival and regulate their function. The colony-stimulating factor-1 receptor (CSF-1R) is a major regulator of tissue macrophage formation, survival and trophic functions. CSF-1R is present on the cell surface of all tissue macrophages and other cell types, including neurons, their progenitors and bone-resorbing osteoclasts. It is activated by two other proteins, CSF-1 and interleukin 34 (IL-34). Studies in mice have shown that the CSF-1R and its activators play an important role in embryonic and postnatal development. Absence of the CSF-1R causes death between late embryonic and early postnatal age. The most striking defects in CSF-1R-deficient mice are abnormal bone structure and abnormal brain anatomy and function. CSF-1R-deficient mice have defective vision and hearing and exhibit structural defects in regions of the brain involved in cognition, memory, control of movement and olfaction. At the cellular level, the number of brain macrophages (microglia) is substantially decreased and the development of neurons is impaired. Studies in which the CSF-1R was selectively removed from progenitors of neurons suggest that the development of neurons is directly controlled by CSF-1R, whereas microglia are involved in the regulation of neuronal function and formation of brain structures important for olfaction and cognition (Fig. 1). Consistent with these observations in mice, the CSF-1R plays an important role in neurological disease. While absence of the CSF-1R, or of its ligands, has not been reported in man, mutations that reduce CSF-1R activity are associated with an inheritable adult-onset progressive dementia. This disease is known as adult onset leukoencephalopathy with axonal spheroids and pigmented glia (ALSP). The mean age of onset of ALSP is 43 years.. Patients often present with neuropsychiatric symptoms, including depression, behavioral changes, paralysis, dementia and seizures and often receive the misdiagnosis of Alzheimer’s disease. Currently, there is no treatment available for ALSP and the disease is lethal within approximatley 7 years of diagnosis. However, a mouse model, which reproduces the main features of ALSP, has been described, in which the mechanism of disease development is being studied and novel therapeutic approaches can be tested. Fig. 2. Potential strategies for therapeutic manipulation of CSF-1R activity in neurological diseases. Studies in mice suggest that activation of CSF-1R would be beneficial in diseases associated with cell death by toxcity such as Globoid Cell Leukodystrophy (Krabbe’s Disease) while its inhibition may reduce the severity of diseases involving inflammation such as multiple sclerosis and Charcot Marie Tooth Disease 1X. Control of microglial abundance can be achieved by activating or inhibiting the CSF-1R and studies in mice suggest that both these approaches may be useful in neurological disease. For example, CSF-1 has beneficial actions in Globoid cell leukodystrophy, by promoting scavenging of cellular debris by microglia which facilitates nerve repair. 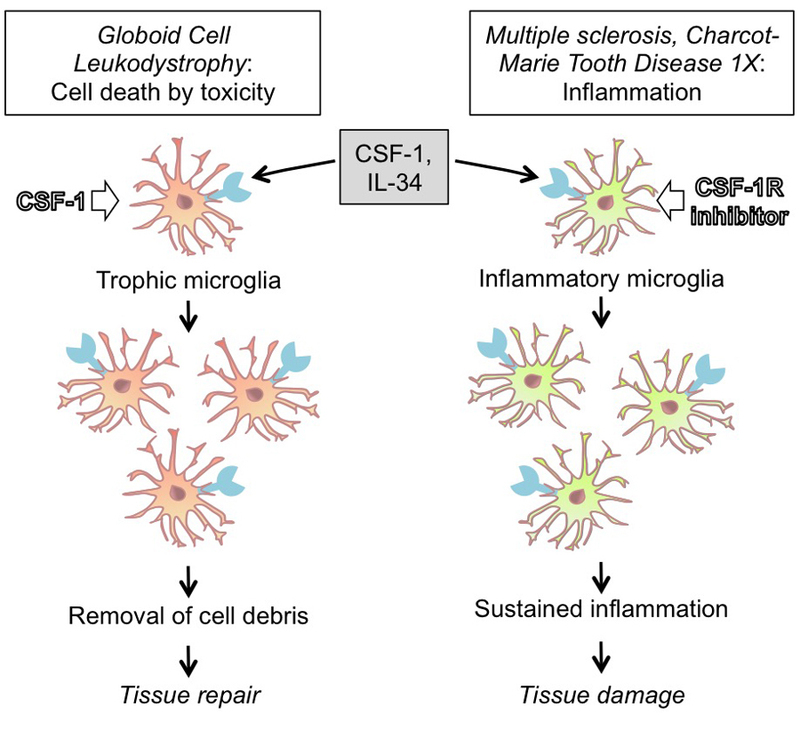 However, detrimental roles in diseases associated with inflammatory microglial activation, such as multiple sclerosis and Charcot–Marie–Tooth disease type 1X have been reported (Fig. 2). CSF-1R inhibitors have been developed and are currently being tested in clinical trials for cancer and inflammatory disease. It would be of interest to determine their efficacy and safety in the treatment of neurological diseases associated with inflammation. Emerging Roles for CSF-1 Receptor and its Ligands in the Nervous System.